Our company is in this line of work since past several years and has gained expertise in manufacturing, supplying, wholesaling and exporting Cushion Covers at a larger extent. 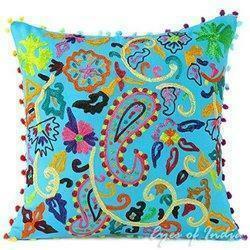 These cushion covers which we are providing to our clients are made up of high quality fabric and thread materials. 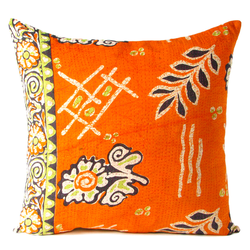 We provide handmade cotton fabric Stitched kantha cushion cover cover and Pillow insert is not included. It can also be considered as decorative item as they are widely used for home decoration in a very stylish way. This gorgeous pillow cushion cover will add warmth style and elegance to any room in your home. 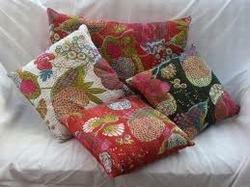 We provide handmade cotton fabric vintage kantha pillow cover and Pillow insert is not included. It can also be considered as decorative item as they are widely used for home decoration in a very stylish way. 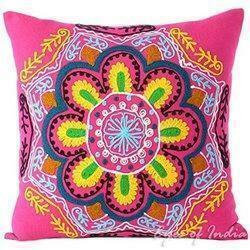 This gorgeous pillow cushion cover will add warmth style and elegance to any room in your home. 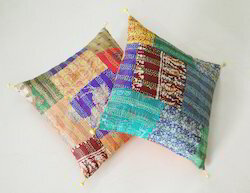 These are very special new hand crafted Kantha Tropicana Cushion. 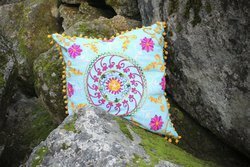 This work is done in West Bengal that provides work and livelihood for women in Calcutta's slums.The entire pillow is painstakingly embroidered with thousands of small and delicate Kantha stitches to create a one of a kind masterpiece. It has cotton backing with a zipper so you can insert the pillow in it easily. Kantha is the ancient Indian art of embroidery, actually the Kantha is a simple running stitch. The way in which the stitch has been used is what makes the quilt extraordinary. While making the shawls, the cloth is given layers that are kept together by the stitches. 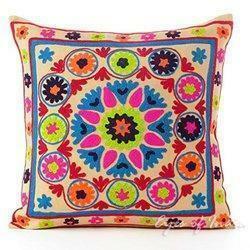 We provide handmade cotton fabric Kantha Patchwork Cushion Cover cover and Pillow insert is not included. It can also be considered as decorative item as they are widely used for home decoration in a very stylish way. This gorgeous pillow cushion cover will add warmth style and elegance to any room in your home. 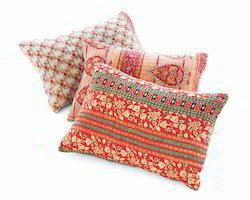 We provide handmade cotton fabric Torpicana Kantha Pillow Cover cover and Pillow insert is not included. It can also be considered as decorative item as they are widely used for home decoration in a very stylish way. 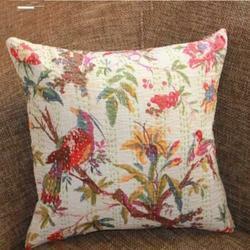 This gorgeous pillow cushion cover will add warmth style and elegance to any room in your home. We offer Beaded Cushion cover which are Exquisite, Heavily beaded, Exceptionally Beautiful (16" x 16") Decorative Throw/Floor/Cushion pillow cover with stunning bead work, exquisite zari work and glittering sequin work on cotton silk blend fabric in exotic shades of Yellow, fuchsia, copper, brown, maroon, golden from the state of Rajasthan in Northern India. Fabulous home accessory for your couch/sofa/bed/floor or even for your walls as a tapestry/hanging. 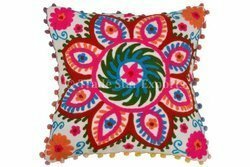 Vishal handicraft is a leading supplier ,manufacturer& exporter of handmade designer home furnishing , kanthas, and many other things, suzani is a art of kezakistan and arebia countries, we are making of suzani embroidery cushion covers, bed covers, shopping bags, clutchers and manu more things in suzani. vishal is a name of trust and quality based company. our quality is our strenth.we are the manufacturer of suzani embroidery goods.we are established in this field last 8 years.